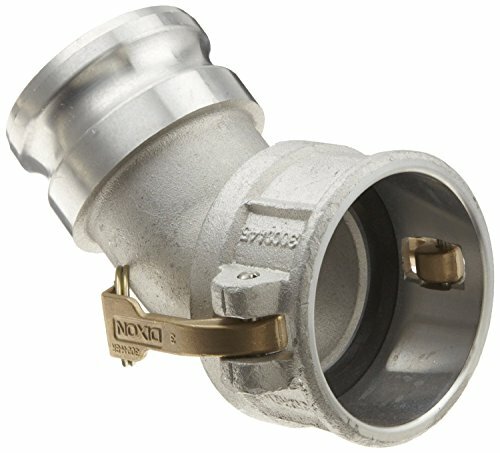 The Dixon aluminum cam and groove fitting has a 45-degree elbow and two openings for connecting two hoses or pipes with cam and groove fittings. It has one female cam coupler end for connecting to male groove adapters and one male groove adapter end for connecting to female cam couplers. The body is made of aluminum for corrosion and tarnish resistance, and it has cam lock levers for locking the fitting's male groove adapter into female cam couplers. This Dixon cam and groove fitting is suitable for use in commercial or industrial flow systems, such as water transport and treatment, waste management, and in petroleum systems, among others, but it should not be used in compressed air or steam applications. Hose fittings are components used for connecting, terminating, controlling, and changing the direction of flow in piping and hose systems in many different industries. When purchasing hose fittings, consider the application, as this will affect material type, shape, size and required durability. Fittings are available threaded, unthreaded, or using another connection standard, such as cam and groove, and come in many shapes, styles, sizes, and schedules (pipe wall thickness).